Funding the development of innovative technologies is always a challenge. The risk is high, the development process outcome is not assured and, in many cases, the integration of a complementary technology that may be owned by another company is the elusive missing link. While Arizona and Israeli companies are realistic in understanding the obstacles that can stymie joint development efforts, they also share a keen appreciation of the synergistic benefits of strategic collaboration. Actually, there are quite a few successful joint technological partnerships between Israeli and Arizona companies in a variety of fields, including renewable energy where the tourism adage “you don’t have to shovel sunshine” could be applicable to both locations. Seven of these joint projects were funded by the U.S.-Israel Binational Industrial Research and Development (BIRD) Foundation, which was established to facilitate and stimulate mutually beneficial technological cooperation between U.S. and Israeli companies. The stimulation comes in the form of strategic matchmaking between compatible companies in both countries, and a $1 million conditional research and development grant per joint project in fields that cover the full spectrum of technology industries. The joint BIRD projects between Israeli and Arizona companies have come from various industries, from Agtech and life sciences to homeland security. 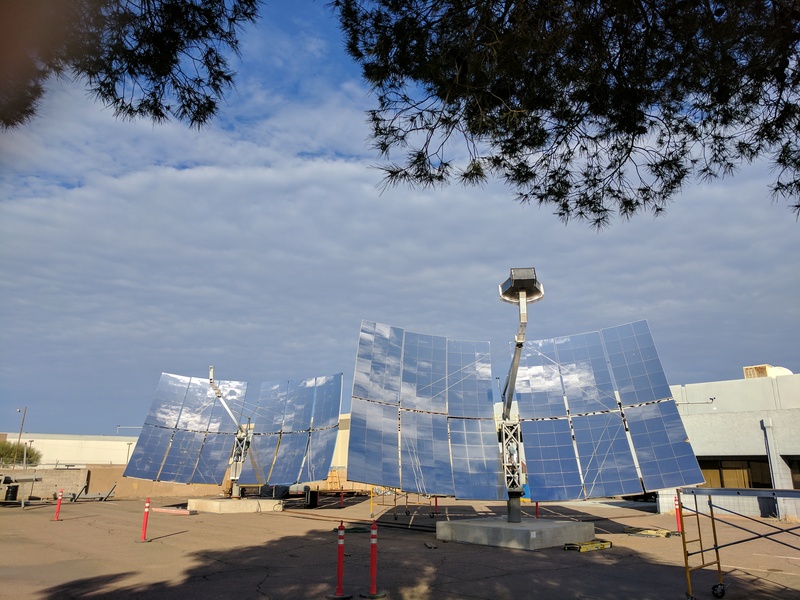 Most recently, BIRD has supported two collaborative projects in the solar energy sector, where both Arizona and Israel have converging interests and, with days of uninterrupted sunshine, a geographical advantage. The project between Southwest Solar Technology (SST) of Tempe and Ben Gurion University of the Negev involved the development and testing of an SST Dish concentrated photovoltaic (CPV) system and succeeded in producing a commercial product that already has achieved initial sales. “BIRD funding helped us begin a development of Solar Dish CPV technology in cooperation with an Israeli university that is a leader in solar R&D,” says Herb Hayden, SST’s president and chief technology officer. The BIRD project provided testing of pre-commercial dish units in the Arizona company’s facilities and at the Ben Gurion National Solar Energy Center in southern Israel. With interested customers lining up for this novel 24-hour solar disk turbine system in Arizona and as far away as Australia, the joint development work between SST and Ben Gurion University could have a resounding impact on the renewable energy market. A second clean energy-related venture being developed by Tucson-based Global Solar Energy and Haogenplast in Kibbutz Haogen combines lightweight flexible solar panel technology with PVC cover sheets to create an innovative sealed cover system for large-scale water reservoirs. By moving the generation of power closer to the point of use, this BIRD project aims to reduce load on the grid and transmission losses, and improve the robustness of the existing infrastructure. While these Arizona-based projects were part of the BIRD Energy program, which focuses specifically on funding renewable energy and energy efficiency projects, the BIRD Foundation promotes collaborations in virtually every area that can show significant innovation and demonstrates commercial potential. Arizona companies have many opportunities to develop their own advanced technologies while taking advantage of Israel’s local talent and vibrant technological ecosystem. The BIRD Foundation can assist by working with companies to identify potential strategic partners and facilitate introductions. For more information, please contact Tal Kelem at tal@birdf.com or visit www.birdf.com. Tal Kelem is director of business development for the BIRD Foundation.